As we get older, there is no doubt that our brains become slower. But here’s some good news for a change: new research suggests that life experience may make up for cognitive decline in old age. It all has to do with the two types of intelligence we all make use of: fluid and crystalized. Fluid intelligence helps you to learn from, and process, information. Crystalized intelligence, on the other hand, represents everything you know through experience and knowledge that’s accumulated over the course of your life. It’s likely fluid intelligence that declines as someone ages but researchers are less sure about what happens with crystalized intelligence in the senior years. Nobody is entirely sure if decision-making skills take a hit as well. That’s why the researchers decided to recruit 336 participants. 173 were between the ages of 18 and 29, while 163 were 60 to 82 years of age. All the participants were asked to answer some questions about economic decision-making traits. Basically, four traits were assessed: temporal discounting (which describes how much someone discounts future gains and losses); loss aversion which is the value someone places on a loss that outweighs a gain of the same magnitude; financial literacy and the ability to understand financial decisions; and debt literacy, or the ability to understand debt contracts and interest rates. The participants were also asked to complete tests that measured fluid and crystallized intelligence levels. The researchers found, when all the tests were completed, that the older participants performed just as well as their young counterparts, and in some instances even better when it came to making decisions. The older participants were more patient when it came to discounting future gains and losses. They were also savvier about financial matters in general and showed a better understanding of debt-related matters. The researchers say the study results prove that experience and acquired knowledge learned over a lifetime help to neutralize the loss of the ability to learn new information as a person ages. They hope that these findings will allow help to be offered to older people in making financial decisions. This help could come in the form of a financial advisor. In contrast, younger adults would be wise to acquire some financial education in order to make better decisions. Young people are often in the position of having to make major financial decisions, such as buying a home or making investments, even though they have no previous experience to rely on. Going beyond the results of this study, let’s move to another decision-making situation that’s proving worrisome to many. Older adults often fall prey to fraudulent advertisers, telemarketers, and door-to-door salespeople. There are constant stories of seniors losing their money. Current research suggests that it’s not memory impairment or dementia that causes seniors to fall for these schemes, but rather changes in the brain that make it difficult to perform decision-making. These types of changes don’t happen to everyone, but can and do affect a subset of seniors. For these older adults, it becomes difficult to make complex choices that rely on emotional processing to figure out short and long term considerations. Studies show that life experience can help seniors with decision-making—and this is great news for those of us worried about what will happen as we age. 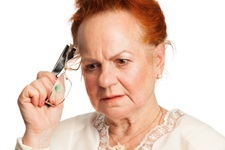 Whiteman, H., “Life experience ‘offsets age-related cognitive decline,” Medical News Today web site, Sept. 30, 2013; http://www.medicalnewstoday.com/articles/266680.php, last accessed Oct. 1, 2013. Denburg, N.L., et al., “Why So Many Seniors Get Swindled,” Cerebrum web site, August 10, 2009; http://www.dana.org/news/cerebrum/detail.aspx?id=23106, last accessed Oct. 2, 2013.